The pieces, that last week still lay on the couch waiting to be assemble to be sports bags, have turned out nicely. I was actually so proud of my own “design” that I had to write down the pattern for you. You can find it here. They look a bit too girly in my opinion but from what I heard Michael’s nieces (age, 5, 3 and 1,5 years old) seem to love them. I will check that this weekend because I’m going to London on friday, Michael already is there this whole week, to spend the weekend with Michael’s family. 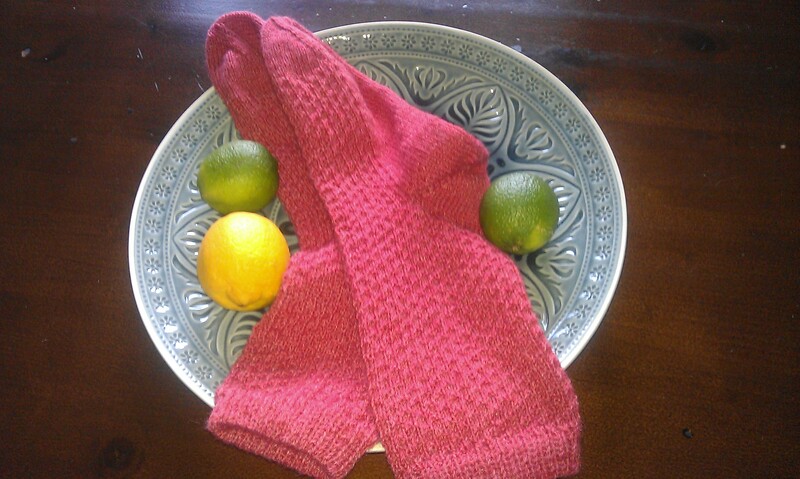 I also finished my Strawberry Sorbet Hermione’s Everyday Socks and because I was out of yarn on the weekend I inserted a bit of felted slippers knitting on the weekend. The ones I had made for my grandma for christmas unfortunately don’t fit and have been passed on to my mum so I made new ones that have a bigger opening so grandma can slip into them even with swollen ankles. I really like the combination of colours in the new slippers which range from a teal to a turquoise over to light blue and ending with a bright deep blue. But they were in the washing machine this morning so II can’t show them to you just now. Thanks to my girls from back home. This is the felting wool you gave me for my birthday. And I also connected all five pieces of my comfy cardigan. 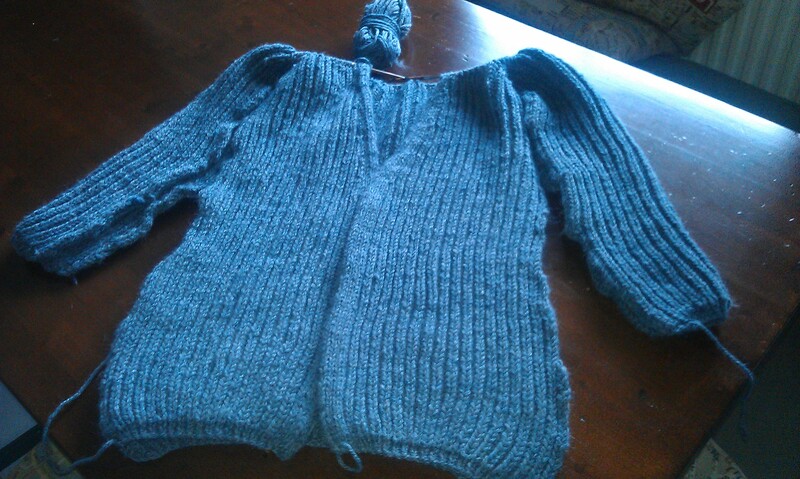 Now it can only take some more days to weeks to finish the raglan arm part. But well. The weather seems to wait for me to finish this warm thing because it is cold and rainy again and not at all like spring. Good for Michael as well because his cabled cardigan is next in line and just waits for my cardigan to be finished. So if I’m quick he might also enjoy his cardigan before spring hits. On my so-called bedside table (actually I have none but our bed has a wide frame so that I can place my books on it) is A Feast for Crows: A Song of Ice and Fire again. I finished the Darmstadt crime story within two day but to be fair, I was sick at home and had time to read. I try to get a few more pages on A Feast of Crows “done” every day so that for next week I can skip it again to read the next volume of the Darmstadt books. Yes I know, that sounds like I hate the Song of Ice and Fire Book which is definitively not true. I like the story, it takes me just so long to read. This entry was posted in Knitting & Crocheting and tagged Cardigan, Knitting, sewing, Socks, Yarn Along by kathatravelling. Bookmark the permalink. Some good inspiration here! Following! WOW that is amazing. traveling i find to be a good time to knit also. especially since my children are all grown ! love the cardigan! I know what you mean about wanting to finish it while you can still wear it. 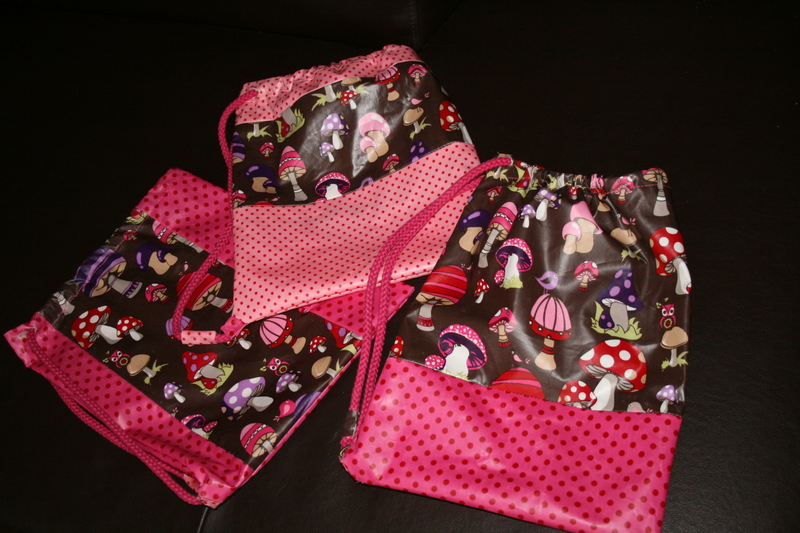 what gorgeous projects…..I love the girly bags!!!! Thanks. I think they’ll clash with their new recipients red hair, but I guess they’ll love them. They are just so girly girls. busy busy week!!! with all those FOs you can have a serious guiltfree startitis spree!! !